For quantitative determination of xanthine and drug effects on its metabolism. • Sensitive and accurate. Use as little as 10 µL samples. Linear detection range in 96-well plate for 30 minute incubation: 0.01 to 2.5 mM xanthine for colorimetric assays and 3 to 250 µM for fluorimetric assays. Xanthine is a purine base that can be found in most animal tissues and fluids. It is a product in the purine degradation pathway, produced by guanine deaminase from guanine, and by xanthine oxidoreductase from hypoxanthine. Xanthine is degraded to uric acid by xanthine oxidase. Clinically, xanthine and its derivatives act on sleep-inducing adenosine receptors as antagonists. 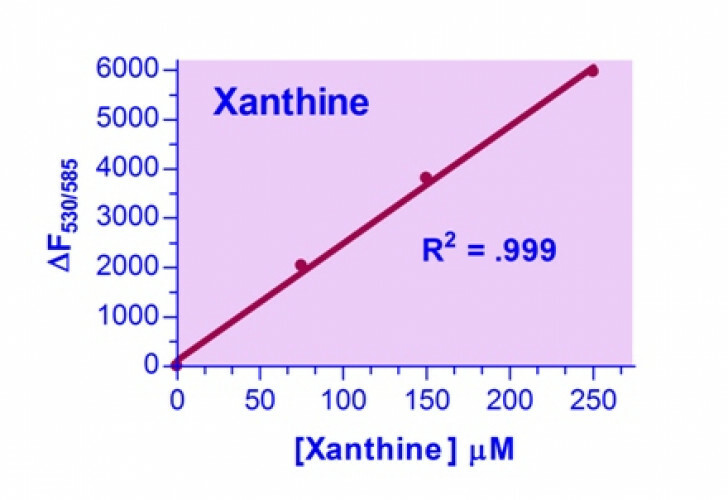 Simple, direct and high-throughput assays for measuring xanthine find wide applications in research and drug discovery. BioAssay Systems’ xanthine assay kit uses a single Working Reagent that combines the xanthine oxidase reaction and color reaction in one step. 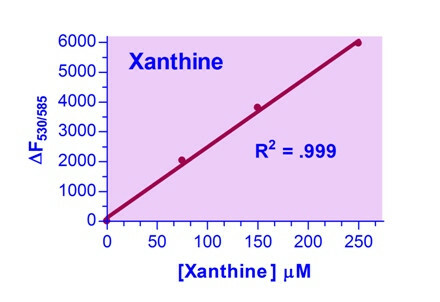 The change in color intensity of the reaction product at 570 nm or fluorescence intensity at λex/em = 530/585 nm is directly proportional to xanthine concentration in the sample. Applications For quantitative determination of xanthine and drug effects on its metabolism. Samples Cell lysate, serum, and other biological samples.